Posted on Fri, Jan 20, 2012 : 9:32 a.m.
Frigid temperatures weren't enough to stop two of the biggest construction projects in the Ann Arbor area this morning. Construction continued this morning despite frigid temperatures at the new Costco store in Pittsfield Township. Although the temperature fell to 0 degrees Fahrenheit around 6 a.m. and was only up to 3 degrees by 9:15, crews were busy at the sites of the new Costco store in Pittsfield Township and the Stadium bridges project in the city of Ann Arbor. Costco, which has hired Seattle-based contractor Jackson Dean to construct 148,000-square-foot near the corner of South State and Ellsworth and behind the Tyner Furniture store, has yet to comment publicly on the project except to say that the store would open in the summer. 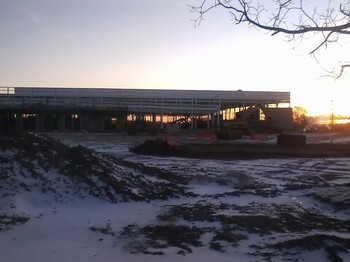 The store has been taking shape fast — perhaps accelerated by generally excellent weather conditions so far this winter. The steel structure of the store has been visible for more than a month — and now crews are stacking bricks. The $22.8 million Stadium bridges construction project began in November and is expected to be completed in May 2013. The project will replace two decrepit bridges. Fri, Jan 20, 2012 : 8:22 p.m.
No news. Reporter still writes story. Now that's a real story. Fri, Jan 20, 2012 : 7:48 p.m. It was cold, and workers still worked. Why is this news? I work in the cold, where's my story? Sat, Jan 21, 2012 : 5:33 a.m.
Fri, Jan 20, 2012 : 5:51 p.m.
BRRRR! Had to jump-start the Hoveround this morning. Fri, Jan 20, 2012 : 4:13 p.m.
Why is there a Stadium Blvd bridge anyway? It looks like that area should be a flat road with an intersection at State and Stadium. There are other railroad tracks to cross main roads in downtown (Main St) so why the importance of a bridge there? Probably a lot less to fix (replace) and eventually maintain. But, I are not an expert....oh well. Fri, Jan 20, 2012 : 7:47 p.m. The city doesn't own the land, the railroad does. And they don't want a grade level crossing there. End of story. Fri, Jan 20, 2012 : 5:34 p.m. I know they looked into this. The intersection looked like that before the bridges were built. But that was a time of much less traffic on Stadium than there is now. The bridges enable them to avoid putting another traffic light there at the State St. intersection, and also avoids any delays from trains that go through there. Also, the city may have determined that if they restored the intersection, there wasn't sufficient room to incorporate the necessary turn lanes because of the existing houses and other adjoining properties. Fri, Jan 20, 2012 : 4:50 p.m.
Fu'baw traffic. And of course UM chipped in ZERO MONIES for this project. Fri, Jan 20, 2012 : 4:02 p.m.
Are they working on the 5th avenue parking project? Fri, Jan 20, 2012 : 3:34 p.m.
Today's technology in cold weather winter clothing makes it possible. I would bet the work is done at a slower pace as it would be during scorching heat. As long as it dry with no precipitation, construction will be able to proceed. Given the soon to be snow event, construction may be halted. Perhaps the longer it stays dry in the coming weeks and months, the sooner these projects can be completed. It's all about safety. Sun, Jan 22, 2012 : 12:48 p.m.
Today's technology in cold weather.......Folks have been working, building roads buildings, bridges for decades using the &quot;technology&quot; that was avaliable in &quot;their time&quot;. (I surley have ). Fri, Jan 20, 2012 : 3:12 p.m. I hope they at least provide a warm up tent to those working. Fri, Jan 20, 2012 : 3:08 p.m. I would say that the lack of wind makes working outside more manageable. Moving around will keep you warm, as long as there's not much of a breeze to blow away your body heat.